We offer the free use of three public computers and a printer, as well as a number of Assistive Technology (AT) software programs and devices, to people with disabilities. 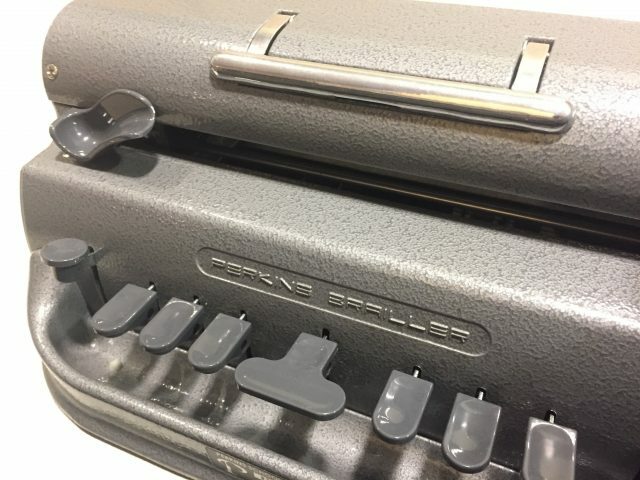 The Perkins Brailler in our office! A man using a LipSync. Cook Magic Talking Microwave, for people who are blind or with low vision — come heat up your lunch! Interested in something not on our list? Wondering if there’s a piece of AT that would work for you? Want to try out some of equipment to see if it’s a good fit? If you have any questions about our equipment or about assistive technology in general, please contact our reception at reception@drcvictoria.com, or (250) 595-0044.